Even in a world overflowing with magic, the mark of the gods is unmistakable. Some mortals actively curry the gods' favour, serving their high ideals or executing their blasphemous designs. Those whom the gods have touched may be inspired, blessed, cursed - the saint and the prophet, the genius and the madman, sometimes one and the same person. * In-depth background for every cult, secret society, and cabal. 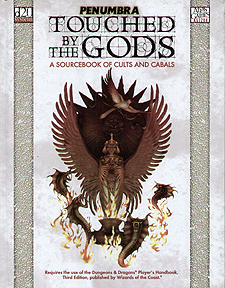 Included are histories, dogma, holy rites and adventure seeds designed to let Game Moderators introduce the mysteries of the occult into their own campaign world. * New deities and the NPCs who would grasp their power, holy weapons, clerical domains, spells, feats and prestige classes, special attacks and abilities, fearsome monsters, creature templates, magical and cursed items, and the clandestine rituals that grant lowly mortals a small taste of godhood. Touched by the Gods is the supplement that players and GMs have been praying for!